Fresh from the launch of Carro Express, the team is back again to shake up the industry. Today, Carro announced that it has raised US$12 million in its latest round of funding. But while funding news are pretty common, what’s interesting is that the 2-year-old Singapore startup is taking the funding and using it to develop a subsidiary that while at first seems unrelated, is actually intimately linked to their main business. 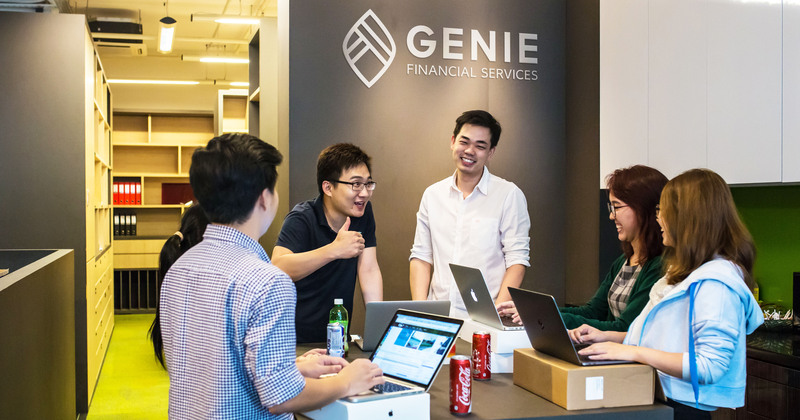 The new fintech kid on the block is Genie Financial Services, and is described to be a hire purchase provider which offers speedy auto loan approvals, and an artificial intelligence (AI)-based chatbot for interested parties to use. Genie is a wholly-owned subsidiary of Carro, and holding the reins is Helen Neo, who has an illustrious 30 years of experience in the auto financing industry. One need not look far to understand why the trend of taking up loans is prevalent. 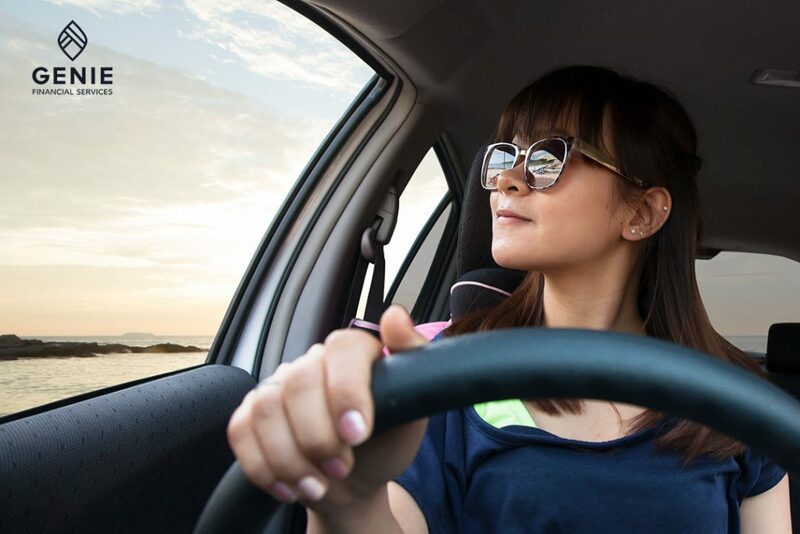 Owning a car in Singapore is a costly affair, and it’s not just the vehicle you need to pay for – it’s everything else that adds up to a whole lot. Thus, it’s no surprise that the regular Singaporean usually needs to take up a loan to finance their car-driving dreams. Genie isn’t only for those who are buying new cars, either. Genie’s scope also encompasses those purchasing used cars, commercial vehicles, Uber/GrabCar financing, and even financing for COE renewal. Basically, if you require something with 4-wheels in Singapore, Genie’s got your back covered. Not just providing the convenience of having loan calculators, application forms and various loan rates available in a single platform, Genie also differs from other financing portals in a few crucial ways – it is able to compute a loan to suit the risk profile of an individual using algorithms, and, living up to its one-stop promise, underwrites the loan for users, as compared to simply redirecting them to banks. All users will need to do is fill up the forms made available on Genie’s website, and the team will handle the rest. 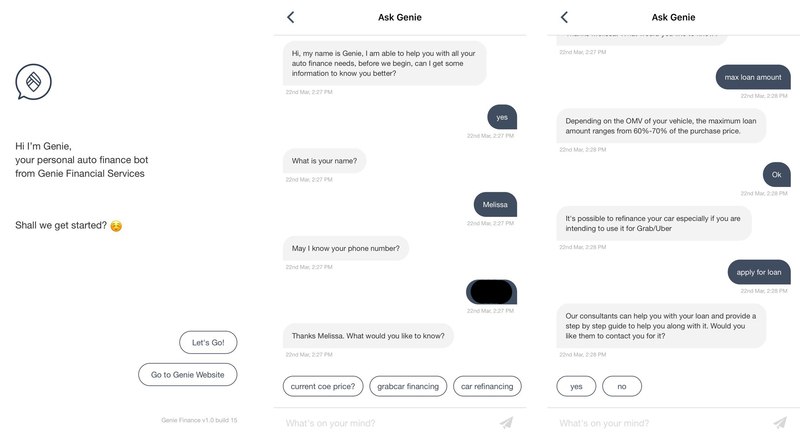 Following the slew of chatbots popping up to serve our various needs, from Bus Uncles to Uber/Grab/taxi promo code curators, Genie also offers an AI-based chatbot, Genie Bot (on iOS and Android), which, for the buyer who can’t afford to wait, offers 24/7 help and guidance. “We were looking at ways to differentiate and more importantly provide customers a better service quality. And that idea came about after having served over a few thousand customers where we realised that the questions were mostly repetitive. We looked into that and decided that the combination of AI, Chatbot and KBMS was the way to go for Genie Finance,” explained Tan. However, the chatbot wasn’t “built off the shelf on top of existing platforms”, and Tan revealed that the situation presented them quite a few challenges – but these were ones they were more than willing to take up. At the moment, the bot is still in its infancy, and using it, I realised that there were limitations in what I could ask on the app. Who Knows What Will Come Next From The Carro Team? Founded in 2015, Carro has progressed leaps and bounds – not just in their original business of dealing with cars, but now, even expanding into the fintech side of the industry. It won’t be surprising if soon, we’ll be seeing even more aut0-related subsidiaries coming from them. Lowest 5 year COE renewal interest rates of just 3.20% till end April. First 10 customers per month will receive a gift card from us with $50 cash credit.